1965 First stereophonic disco system debuts at the 1964-1965 World’s Fair in New York. 1970 David Mancuso starts throwing after-hours parties “The Loft.” He and Alex Rosner set a new standard for clubs everywhere by adding separate tweeter arrays and subwoofers. 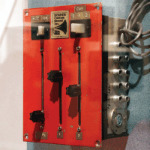 1971 First DJ mixer is designed for the Haven Club by Alex Rosner. 1974 Grandmaster Flash develops his “Quick Mix Theory” for cutting and mixing records. 1977 GLI PMX 7000 Mixer. First U.S. mixer to incorporate a horizontal crossfader labeled “Transition Control,” and first affordable DJ mixer. 1986 Rane MP 24 Club Mixer: Cleanest and quietest DJ mixer to date and First use of studio-grade faders. 1998 Pioneer EFX-500 Effector. First DJ effects box that added echo, flanging and filtering to the performing DJ’s repertoire. 2001 Pioneer CDJ-1000 Digital Vinyl Turntable. First CD “turntable” using a touch sensitive platter that accurately emulated a vinyl turntable. 2004 Numark CDX Turntable. First standard 12” motorized platter with vinyl record and slipmat for controlling CD play. 2010 Rane Sixty-Eight Mixer for Serato Scratch Live is introduced with two USB ports, the first mixer allowing two DJs with their own laptops to hand off sets without any disconnect. 2012 Rane Sixty-Two Mixer for Serato Scratch Live replaced the TTM 57SL with dedicated lit buttons for cues, samples, loops, and dedicated onboard effects. The two USB ports allow two DJs to share the mixer between two laptops, even if they run different software.